As the world’s population rises, and expanding cities pave over fertile soils, it is becoming harder to produce food for everyone1–3. By 2050, more than twice as many people will live in cities as did so in 2000, and on three times as much urban land. Around 2% of the world’s best croplands will be lost, mainly in Asia and Africa, where cities are growing quickest3. No wonder governments rush to protect farmland and limit sprawl. US federal programmes are banned from building on valuable agricultural plots. 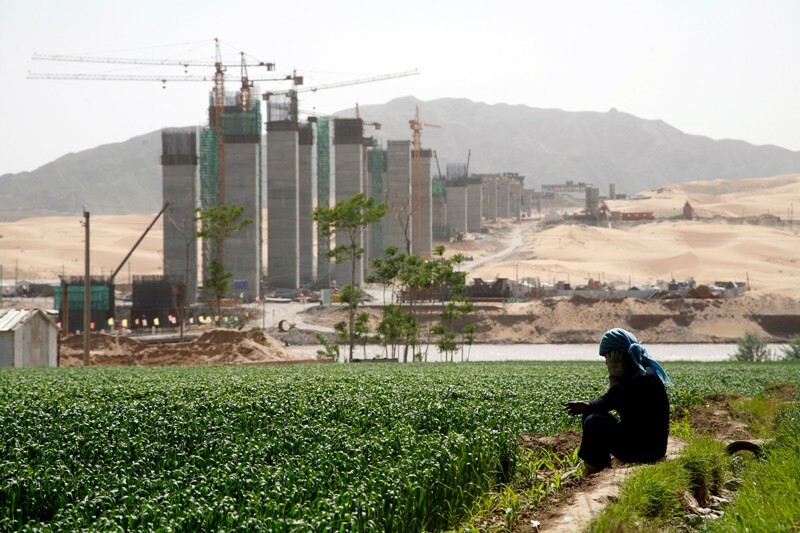 China reclaims natural lands to compensate for requisitioning cropland for development. But curbing the loss of agricultural land addresses only half the problem — food supply. A bigger problem is the rising demand for food, particularly for animal products. Americans and Europeans get 60–80% of their protein from meat, eggs and dairy. Today, people in China consume half that amount of protein in total, according to the Food and Agriculture Organization of the United Nations (FAO). But diets in cities in the developing world are becoming more like those in Western nations4. Annual global meat consumption has almost doubled since the 1960s: from 23 kilograms per person in 1961 to 43 kilograms per person in 2013, FAO data show. And city dwellers in the United States and Australia, for instance, eat five times more meat and dairy foods than the global average for rural residents. Urbanites also waste more food5. In Shanghai, 80% of households and 40% of restaurants throw away edible produce amounting to 12% of all food supplies. Just 2% is discarded in rural areas. Globally, 30–50% of food is wasted. All these trends affect food security. Rearing livestock is also inefficient. It takes 3–8 kilograms of grain to produce 1 kilogram of meat, displacing crops that could have otherwise fed humans. It takes four times more cropland to deliver the same quantities of energy and protein to humans through meat products than it does through a vegetarian diet6. Approximately 85% of the grain produced in Europe and the United States is fed to animals; in China, the proportion is 65%. Livestock causes more than half of all agricultural pollution2. Plus, excessive meat consumption is linked to obesity, diabetes and coronary heart disease. As living standards rise and urbanization escalates, changing diets lock up more land than city development itself. Globally, four times more cropland (8%) was taken for livestock production than was lost to urban growth (2%) between 1990 and 2010. If diets continue to change, even more cropland will be needed to produce animal feed. Forests will be cut down and other natural areas turned into farmland. Policymakers must manage cities and rural regions together, not separately, to ensure that food production, consumption and waste are treated as a single system. 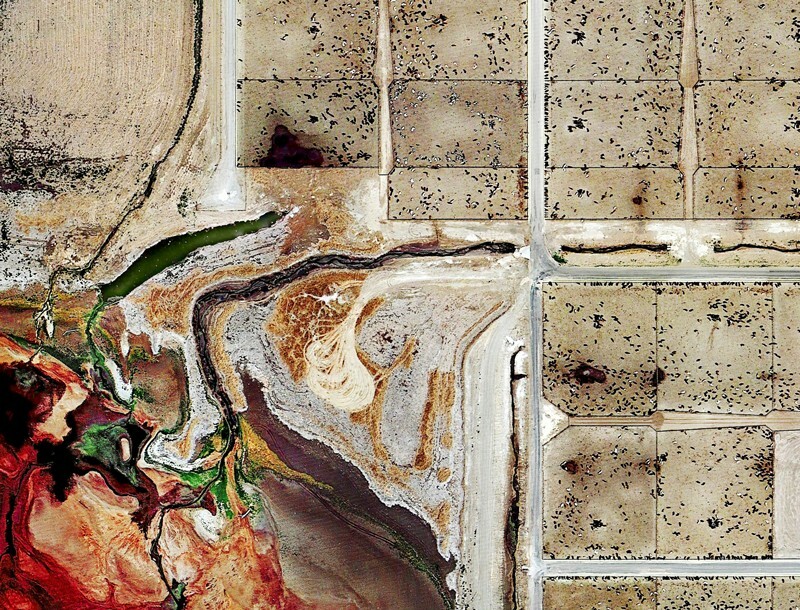 Policies should limit sprawl to make land available for agriculture, and discourage meat-eating. Urbanization threatens food security in two ways: the first is lost production. For example, the city of Zhengzhou on the North China Plain is in a region known as the breadbasket of China; the city has more than quadrupled in size since 1990 (to 501 square kilometres today). Delhi in India has lost 11% of its cropland since 20017. Policymakers have stepped in to slow such losses and reclaim land for agriculture8. Between 2000 and 2010, China increased the area of its croplands by 3% after converting more than 4 million hectares of uncultivated land, forest, grassland and wetland. However, reclaimed cropland is often of lower quality than that where cities sprang up. Soils can be dry and nutrient-poor, and land can be fragmented, steep or high in salt, making farming difficult. Some governments both prioritize urban growth and curtail rural development. Such policies can free land for farming, by stopping the sprawling construction that is common in the countryside9. Yet in 2010, China paved over four times more land in rural areas than it built on in cities, even though less than half of its population lives in the countryside1. Since 2009, the Chinese government has paid thousands of dollars to workers migrating to cities to demolish the rural houses they abandon8. By 2030, one million hectares of rural land should be returned to agriculture in this way. Japan has used similar strategies since the 1920s. Consolidating large areas of rural land allows the use of more intensive farming methods and results in higher yields. Small farms have to use more fertilizers and pesticides to increase their crop yields, causing environmental harm and pollution1. Urban and industrial development can boost food production in other ways, by providing fertilizers, irrigation and productive crop varieties, for example1. Food consumption is the other side of the coin. Its impacts are harder to see, and policy interventions are scarce. Yet managing consumption is a more powerful tool for food security than just protecting land. The global shift to meat-rich diets since the 1960s means that an extra 240 million hectares of cropland (15% of the total area) around the world is devoted to growing animal feed, compared with the area that would have been needed had diets not changed. A similar area again will be needed if current trends continue to 2030. 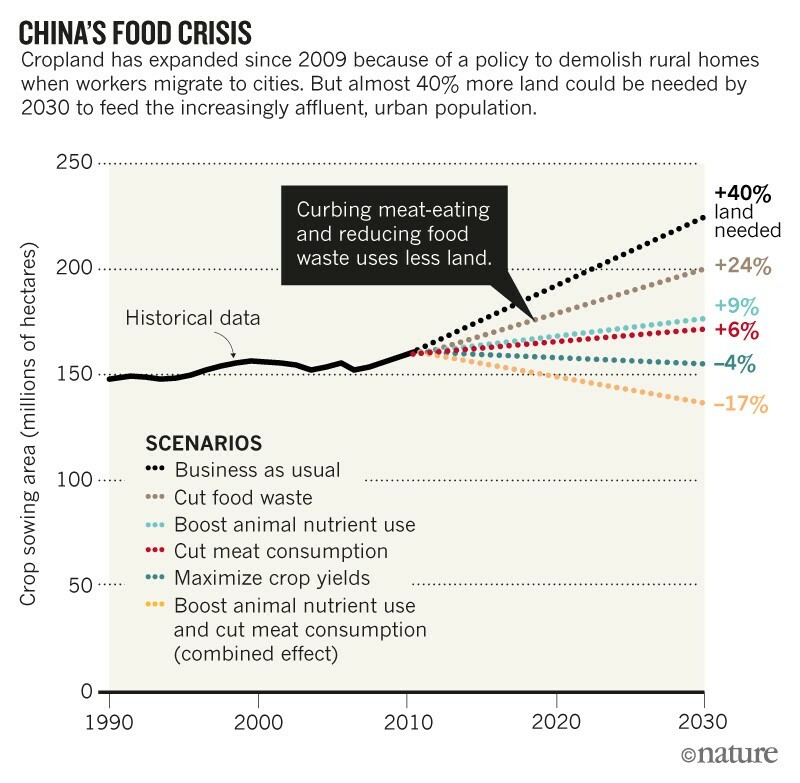 By then, we estimate that China will have to increase its cropland area by 40% from 2010 levels to 227 million hectares (see ‘China’s food crisis’). Given that Chinese cities dump 18 million tonnes of uneaten food each year, reducing food waste by three-quarters would cut this requirement to 200 million hectares. Capping the amount of animal products Chinese people eat at 40% of daily calories (as national dietary guidelines suggest) and improving the efficiency with which livestock take up nutrients would help. Even small dietary changes have a big effect: four times more plant-based food can be produced in the space used for animals; only 20% of the nutrients from animal feed are passed on to people. Crop yields in middle-income countries such as China can be 10–40% lower than those in developed nations, because small farmers in less-developed nations often lack the latest agricultural knowledge and facilities such as irrigation and machinery. Despite this, by focusing on crops grown directly for human consumption and enhancing agricultural yields to match those in Europe, China could meet its 2030 food and nutrition needs using less land than today. Governments should take four steps to mitigate the impacts of urbanization on food security. First, governments should set up campaigns to promote optimum diets and reduce food waste. For example, many universities in China promote a ‘balanced diet pagoda’ in their cafeterias, which recommends that people eat mostly cereals, vegetables and fruit, and smaller amounts of meat, eggs, milk and oil. A campaign in Shanghai urges residents to clear their plates. One report has proposed that the European Union should halve its meat and dairy consumption by 2050 (see go.nature.com/2mddbjb). Scientists and industry need to develop techniques to preserve fresh food for longer, including better refrigeration. And food-sharing initiatives should be encouraged, as now happens in many cities, including London, New York, Melbourne and Shanghai. Second, planners should prioritize both compact urban development and efforts to consolidate agricultural land. Third, skills training and funding might be required to enable farmers to manage larger areas, maximize yields and minimize inputs. Governments should invest in improving irrigation, roads and machinery. And farmers and scientists must be brought together to share knowledge and update skills12 to follow best practices in choosing crop varieties, fertilization and irrigation. Finally, livestock breeding and feed mixtures must be improved in urbanizing countries, to raise the efficiency with which animals use nutrients and to match those in the United States and Europe. Governments should offer incentives for livestock farmers to switch from beef and pork to producing milk, chicken and fish, which have lower environmental footprints. Maximizing the use of crop residues as animal feed should be encouraged. And better pasture management is needed to increase the total supply of products from ruminants — particularly the use of extensive grazing systems for areas where crop production is not suitable. As the planet urbanizes, managing food demand while optimizing supply and banishing waste is the only way to ensure everyone has enough to eat.